With the federal bail out of the GSEs Fannie Mae and Freddie Mac, even a blind man can see that the economy is tanking at full throttle. More bank failures are imminent, likely including the investment house Lehman Brothers. The fall-out from the crashing housing market is far from over. House values are falling, credit is almost non-existent and "consumers" are getting flattened. We appear to be in for the worst economic and financial crisis in decades (Nouriel Roubini, RGE Monitor). It is not my intention today to talk about the economic crisis. To understand that, you can visit iTulip, RGE Monitor or Chris Martenson, among others. This brief article is for those whose chief concern has been peak oil. I conclude that peak oil will be pretty much off the radar in the next few years among the public, the media and politicians. In my previous writings, I have stressed that all bets are off on oil production & price in a severe recession scenario. (A "recession" is when your neighbor loses his job; a "depression" is when you lose yours.) How does this affect peak oil scenarios going forward? Here's the graph, marked up a bit as usual. No trend line is shown because the price trend no longer matters during the recession. I've been reluctant to make this forecast because I was hoping it wouldn't be necessary. A strong price signal was the best indication that Americans have a long term problem to solve, as we saw when oil spiked to $147/barrel. Even as recently as August 18th, I still thought that the latest oil price slide was leading to an over-correction contrary to the 5-year trend. So much for wishful thinking. We should always adjust our conclusions as the circumstances change or become clearer. I agree with most of Charlie Maxwell's recent price forecast (Barron's, September 8, 2008). I expect oil prices to dip down into the $75-$80 range by the 1st quarter of 2010, although this price floor may occur sooner in 2009 depending on how the economy is faring. The situation has little in common with the oil supply shocks of the 1970's and early 1980's when demand fell off sharply twice. This time around, global crude oil demand will remain fairly robust (above 72.5 million barrels per day) throughout the recession. All liquids demand will likely not fall below 85.5 million barrels per day. Demand growth will slow in the BRIC (Brazil, Russia, India, China) economies and in the Middle East, but will not become negative as it has in the OECD countries. Thus non-OECD demand will mostly compensate for slackening consumption in the advanced economies. 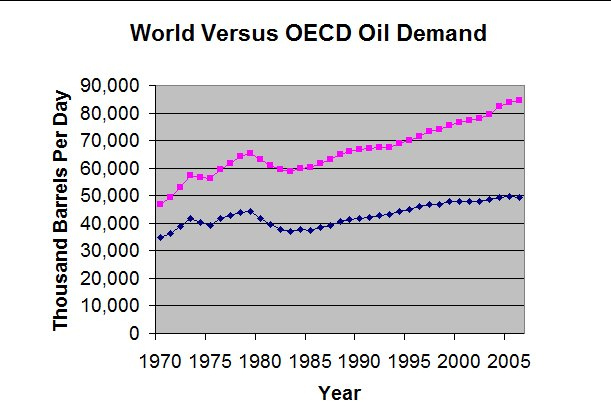 Demand slumps within and outside the OEDC will thus not move in lockstep as they did in the 1970s and early 1980's because of continuing, albeit slower, economic growth in developing world (graphs left, in the first graph, OECD demand is in blue, world demand in red). I am non-committal here about the length of the recession. I will assume that Nouriel Roubini's prediction that the recession will go on about 18 months is correct, contrary to Eric Janszen's view (at iTulip) that the downturn could go on much longer because it will take several more years to work out the housing and credit slumps. Janszen believes that only another bubble, this time in alternative energy, will allow us to break out the recession (ASPO-USA, February 13, 2008). He may be right. Oil demand will no doubt remain below global production capacity during the downturn if it's as severe as Roubini thinks it will be. Lower demand will lower the oil price. I stick by the forecast I made in Peak Oil Is A Done Deal (ASPO-USA, July 16, 2008), but that was a sustainable productive capacity estimate, not an actual supply forecast, a subtlety that eluded some of the people who read it. It is not clear what floor price OPEC will defend, as explained in As Oil Prices Fall, OPEC Faces a Balancing Act (New York Times, September 4, 2008). OPEC wants to maintain revenues but can not afford to throttle back production too far to keep prices high—the cartel does not want to drive down OECD demand during a recession. OPEC's decision this week to cut about 500,000 barrels off current production merely rolls back increases made earlier this year when oil was over $135/barrel. I predict OPEC will actually defend $90/barrel oil when we get there, but will not be able to keep oil from sliding to its bottom at $75-80. All these considerations essentially take the peak oil issue off the table in the next few years. I do not mean to imply that peak oil is a dead issue—far from it! But policy-makers and the "free" market are incapable of planning ahead and people generally are myopic. Only sustained high oil prices get their attention. Survival in a reeling economy is going to trump worries about a flat or declining oil supply causing renewed price escalation after 2010-11. Peak oil is going to be a hard sell under these circumstances. The economic downturn couldn't come at a worse time for those who hold out some hope that meaningful policies will be implemented that cut America's oil dependency over the longer term. If the OECD economies start to recover in 2010, and that's a BIG IF, we will likely see a repeat of the 2007-08 oil price escalation in 2010-11. Paraphrasing the great Yogi Berra, it will be déjà vu all over again, but that's at least 2 years down the road. Near the end of his 1st term, whoever is elected president will discover, much to his consternation and surprise, that changing our energy policies to fight global warming wasn't really the highest priority after all! If he wants a 2nd term, that is. The problem lies with the distinction—I should say the lack of a distinction—made between liquid fuels and renewable energy sources. Everywhere you look, the mantra is the same: clean, green solar, wind, geothermal, etc. will cure our oil dependency. Renewables, which make up a negligible share of our total energy consumption, are meant to directly replace coal-fired power generation, not the liquids that fuel over 95% of our transportation. Rarely mentioned is the pathway by which renewables replace petroleum. The assumed pathway is greater fuel efficiency via electric transport and biofuels, with an emphasis on plug-in electric vehicles (PHEVs). I will ignore the empty Republican promise that we can drill ourselves of this mess. Other measures, like hydrogen fuel cell vehicles, large-scale coal-to-liquids production, or compressed natural gas vehicles, are non-starters. Is the scaling for biofuels & partially electric vehicles any better in 2018 or 2020? Not much. The price will certainly be too high for many to be able to afford gasoline or diesel. Airlines? What airlines? Not for you, unless you're among the wealthiest few. So, how does the future look? First, we're entering a severe recession which forces oil supply concerns to take a backseat. Second, peak oil is already on the (far) back burner anyway because our presidential candidates and their advisers believe that global warming is the only problem related to energy that matters (ASPO-USA, May 7, 2008). Actually, what these people won't tell you is that $5-6/gallon gasoline is just fine with them because it cuts tailpipe CO2 emissions through ruthless "demand destruction." In the real world, however, concrete economic failures brought about by high oil prices will always trump more abstract climate change concerns. It's just a matter of time before oil prices change the political agenda, but it's going to be a while before that happens. So if you were expecting anything to be done about America's oil dependency in the foreseeable future, you have my sympathy because it ain't gonna' happen. So much the worse for all of us farther down the road. 1. The gun-toting, moose-hunting, "pro-life", anti-science, creationist, global-warming denying, small-town valuing, beauty-pageant runner-up hockey-mommy McCain chose as his running mate is not helping matters any. Sarah Palin was brought in as a cynical ploy to appeal to the Republican base, lure Hillary Clinton voters, and continue the "drill, drill, drill" fiction. Apparently, John McCain is so narcissistic that he thinks that he'll live forever, or at least through his term(s) of office should he be elected. Americans will surely get the government they deserve.